A short time ago my feet were sinking into the coarse black sand of a remote Icelandic beach. My heart began to sink with immense sadness as I noticed some of the larger objects weren’t the expected rocks or shells that one might find on a beach, rather they were chunks of plastic of all shapes, sizes and colors. I took to picking up as much trash as I could hike back to the car. A tear fell from my eye as I left the scene far from pristine. A proper cleanup would have required a week’s work from a solo picker, which I didn’t have time for on my one day off work. I did what I could; yet it didn’t feel like it would suffice for mother earth. I spent the next few weeks reflecting upon that moment with the same heart wrenching sadness that I initially felt. To top it off, my carbon footprint to live and work in Iceland was immense. I had traveled halfway across the globe in a variety of planes, and automobiles to guide at a helicopter skiing operation on the Troll Peninsula. Talk about a hit to my moral conscious as an “environmentalist”. The realism of the situation intensified with a few social media posts that went up over the following weeks with regards to trash on Everest and the Great Pacific Garbage Patch. The question that resonated in my head was a culmination of these guilt ridden emotions. 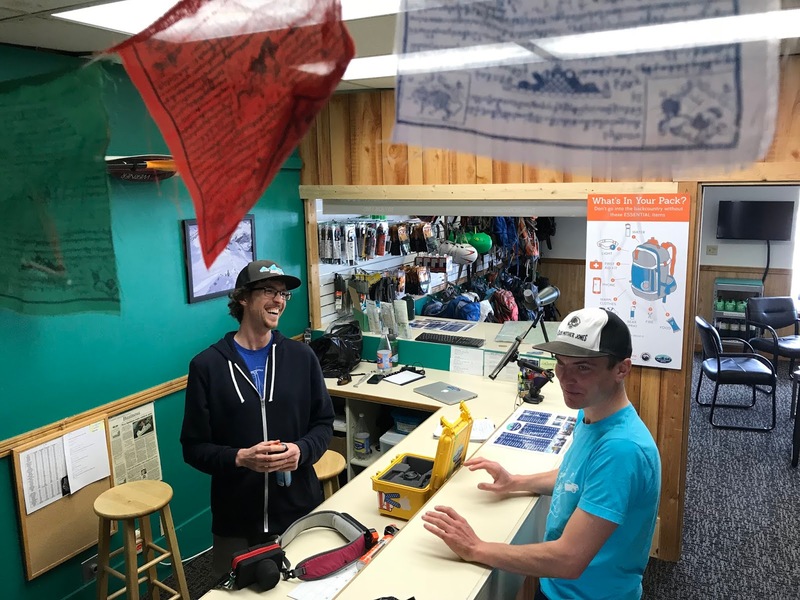 “Is there anything I can do?” The question circulated through my thoughts for some time in a most pessimistic manner until a recent talk with Patrick Collins, Owner of Teton Backcountry Rentals, shed light on an optimistic strategy. Patrick and I began to talk about organizations like POW, Outdoor Alliance, SCA, and the Access Fund that have a hand in environmental preservation and conservation. We talked about their initiatives along with the successes and failures associated with them. We talked about current environmental policy in America and the overall degradation of laws that protect our lands and our waterways on a national level. I can’t lie and say that this part of the conversation was all bliss, but reality hurts, and it needs to hurt for there to be change. We continued further down the rabbit hole until our conversation made its way to Jackson, WY. We ultimately decided that the most important conversation lie in our backyards. The local level presents the most opportunity to change with the least resistance from political and social structures. We began to talk about the great work being done with a N.I.M.B.Y. mindset by the Jackson Hole Conservation Alliance to keep Snow King Mountain truly local, Incredible nature mapping projects by the Jackson Hole Wildlife Foundation in an effort to support the health of our local flora and fauna, and Friends of Pathways extraordinary efforts to connect all of Jackson Hole via human powered trail systems. It isn’t difficult to get overly emotional with such a grim politics of the current environmental structure on the national level. But I think we can all agree that on a local level we want to preserve our environment for generations to come. So what about the fact that most of us drive cars that run on some form of fossil fuel, heat our houses, watch television, embrace the globalization of goods and technology, and happily eat berries out of their local growing season or buy our organic spinach in non recyclable plastic containers? I know… it’s a lot to digest on paper. So the question re-circulated when I asked Patrick, “ What can we do?” The answer isn’t simple, but it starts with offsetting our harm to the environment. We got to talking and decided to start an in house think tank dedicated to supporting the local environment while enhancing businesses in the area. We started with a simple structure. What gear do we rent out and where do people use it? A couple of the most rented items are binoculars and spotting scopes. Where do these items get used? Most people are using these along the Antelope Flats road. Most of our customers take to the sagebrush flats in search of the hoot of a barn owl, the magnificently meandering Red Tail Hawk in search of a meal, the simplistic soar of the American Kestrel, the conversations of the chirping Mountain Blue Bird, and the grumpy old Grouse protecting their nests. Most of TBR’s clients drive up the road with their eyes fixed to the sky in search of the avian inhabitants. Going through the loop only to look down for the Bison, Moose, or occasional Fox. But with increased traffic to any area comes increased pollution. 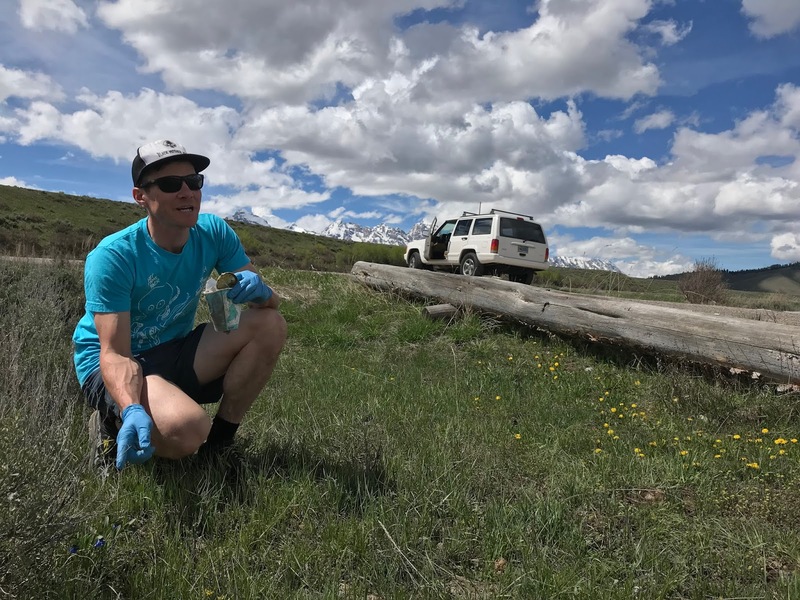 Most clients don’t look into the furrows of the sandy soil, or the folds of the blooming sagebrush to find looming micro trash that has an extremely negative impact on our local ecosystem. All of these pollutants eventually harm the ecosystem as birds create nests with micro trash that makes its way into their stomachs and wreaks havoc on their digestive tracts. 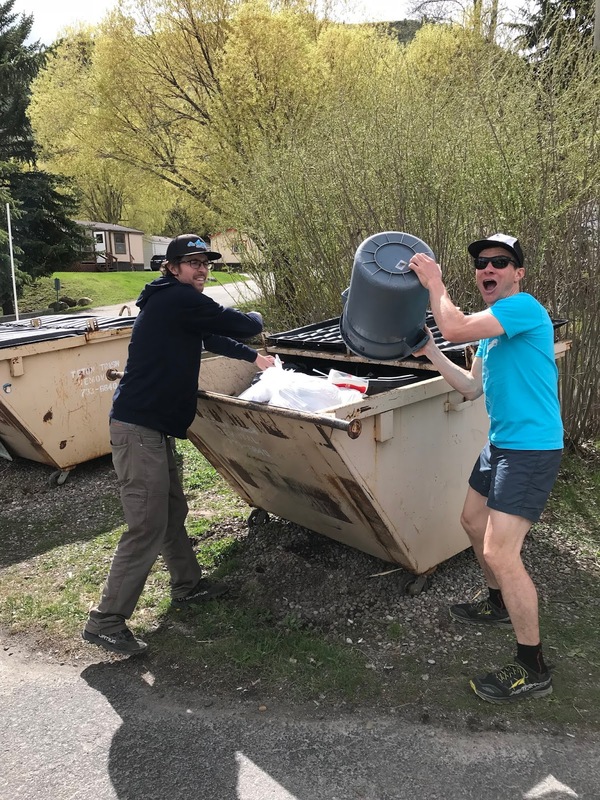 In doing his part for the community, Patrick decided to offer rental incentives for his employees, friends, and anyone willing to offer a helping hand. 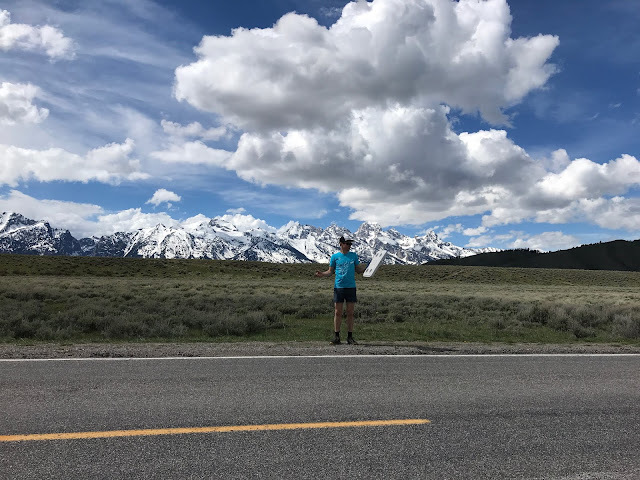 The hope was that with discounted rental incentives along with truly rewarding work, he could recruit a rag tag clean up crew for an area often overshadowed by the beauty of Grand Teton National Park. Needless to say, the first annual TBR cleanup was an absolute success. Over forty pounds of trash from small wrappers to large plastic Rubbermaid tops and everything in between. Teton Backcountry Rentals has started with the first step to local awareness. What will you do? Excited for summer adventures? So are we!! Copyright Teton Backcountry Rentals. Picture Window theme. Powered by Blogger.